It is the 63rd day and Pepsi is due to have her pups. Labour has begun. She was off her food overnight and is now digging in her carpet, preparing her nest. It will not be long. Many people tell me how much fun they think it would be to raise a litter of pups. What they do not understand is that there are risks involved each time a dog is bred. Yes, it is cute when those babies are born, but there can be complications, as well. Over the course of 20 years in the dog-breeding business, I have gone through many emergency Caesarean sections, lost numerous pups during delivery and spent thousands of dollars on vet bills. By the time the pups reach four weeks of age, and you start to wean them from mom, you now have the tedious job of scooping poop. In the end, one hopes for a healthy litter of pups, ready to go home around the age of seven to eight weeks. I breed Labrador Retrievers for hunting; therefore it is important to me that the parents come from hunting lines. A dog’s pedigree lists a title, or titles, in front of his or her name, such as FTCh (Field Trial Champion), CFC (Canadian Field Champion), AFTCh (Amateur Field Trial Champion), NFTCh (National Field Trial Champion), MH (Master Hunter), SH (Senior Hunter), JH (Junior Hunter), to name a few. The title Ch represents a show championship, rather than a field title. 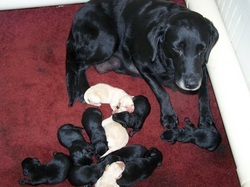 Labs bred for show are bred for looks and conformation in the show ring. They may also be purchased for hunting dogs, as many hunters like the bigger head and stockier style body. However, there is a difference between the two types of Labs. The show Lab is typically shorter in size and, although many can learn to hunt, is not usually able to take on a full day of hunting, unlike the field Lab. With the show Lab, you need to provide more rest breaks throughout the day. Field-bred Labs are longer and usually leaner in build; hence they are better able to work in the fields and hunt for longer periods at a time. They also tend to move more quickly in the field, than the show bred Lab. Some people would say that the field-bred Labs are more hyper and less controllable. However, this is not necessarily the case. If you are buying a dog from a breeder who is into competing in trials, then they may be breeding for a high-powered, energetic dog. However, if you tell them that you are looking for a hunting companion, then your breeder should be able to sell you an appropriate animal. Ninety percent of the people who purchase a dog for hunting are looking, first and foremost, for a family companion. In this case, hunting is a secondary consideration, and is only for a few months out of the year. If possible, ask the breeder for bird introduction. You want to see that the pup you have chosen is interested in birds. Make sure that the pup wants to pick -up and take off with the bird. There is always a number one pup in each litter. The opportunity for first pick of the litter is an advantage, as there is a wider selection from which to choose your gundog. Watch your pup closely when he or she is on a live or a frozen bird. You want the pup that will stay locked on the bird, allowing nothing to get in his or her way. The pup should be focused on chasing the bird. Chances are that your breeder has already been playing with and watching the pups, and will be able to pull out the birdies when you get there. A birdie is a dog that will give up everything, including food, to get the bird. A gundog’s physical appearance is a quality that really comes down to personal taste. For me, the look of the dog is important. If you have a few to choose from, find the look in a pup that you like. Get your breeder to hold up two pups together, and take a look at their faces. Some will have a longer snout, versus a more square snout. Some will have larger paws, or a broader head. Keep in mind that you want a dog that fits your hunting style. If you hunt from a boat, you will likely want a smaller dog. If you hunt for large birds, like geese, you will want a larger dog that can carry a bird of that size. As field bred Labs are usually longer and leaner, hunters tend to prefer this style of Lab, because they can work in the fields for longer periods of time. Gundog breeds are typically divided into three categories: retrievers, pointers and flushing dogs. The type of breed that one chooses to purchase for a gundog is a matter of personal taste, and most hunters select a breed that they have worked with in the past, either due a good experience with the breed, or for more sentimental reasons. The breed that one chooses really depends on what one is looking for in a gundog. For example, I imported Deutscher Wachtelhunds from Germany, because some hunters prefer a smaller dog. However, it should be noted that this particular breed, and dogs like the English Springer Spaniels, do not do as well in cold waters, due to their type of coat. The Lab is the most versatile, especially when it comes to hunting waterfowl, detection work for drugs and bombs, sniffing out mould, avalanche rescue and agility. Labs are extremely safe around children; hence they make a great family companion, which is the main reason why this breed is still the best selling breed in the world. Many hunters like the pointers (bred for their instinct to point towards the hunter’s game), because they find a Lab too quick to keep up with. Some hunters prefer a slower pace in the field, so they would likely choose a dog like a German Wirehair, a German Shorthair, a Vizsla (Hungarian Pointer) or a smaller breed like the Brittany Spaniel. There is nothing more beautiful than watching a really well trained pointer or flusher (bred for its instinct to flush, or drive, game out from hiding) at work. Many people underestimate the capabilities of these dogs. Meet the parents. If you are getting a male, he will most likely look more like his father than his mother. Get a feel for the parents’ kindness, working ability and achievements. Everyone likes to brag about their dog; you need to form your own opinion. Take a look at the parents’ pedigrees to see how many titled ancestors there are in the past three to four generations. If the parents have some titles, it is likely that your pup will be intelligent, trainable and have lots of bird drive. These are important traits to look for in a working dog. If it is possible to see the parents at work, take the time to do so. A working gundog should be eager to work, obedient when sitting in a blind and run like the wind. If you see a sluggish dog that is painful to watch, or does not want to get in the water, chances are that this is not a good litter to purchase from. Do not get hung up on the dog just because it is a pup. There are many more where that one came from. Remember, a timid puppy will grow to be a timid adult, and chances are that a timid dog will not make a good hunting partner when it is time to fire guns in the field. Before purchasing your puppy, you need to ask yourself a couple of very important questions: “Am I ready to make the commitment it takes to raise this puppy?” and “Am I financially capable to do so, at this time?” Your whole family has to be on the same page when it comes to training, feeding, walking and all other aspects of your new dog’s care. It is impossible to state that any given dog will be completely free of genetic imperfections. In our breeding program, we only breed dogs that are certified to have normal hips that show no sign of Hip Dysplasia, as evaluated by the Orthopedic Foundation for Animals (OFA). We also require all dogs in our breeding program to have an eye exam, performed by a certified ophthalmologist from the Canine Eye Registration Foundation (CERF), in order to guarantee that they are free of inherited eye problems. We breed only when we are satisfied that these dogs are sound. We feel that by adhering to these standards we are cutting down the odds of producing a defected pup. Ask your breeder for copies of the parents’ OFA and CERF certificates. After all, a hunting dog is useless without good eye-site and sound hips. Your health guarantee on hips and eyes will have an expiry date, so ensure that you know this deadline. It should allow just over two years. Your puppy’s first set of shots, tattoo and the removal of his or her dew claws, should all be completed before your new addition goes home. Your pup should also come with six weeks of free pet-secure insurance, offered through the CKC (Canadian Kennel Club). This offer is priceless. You want to be covered in the case of unexpected injuries that can occur during rough play with an older dog or something as simple as landing poorly after a leap from a bed. Pet-secure insurance ensures that the majority of your vet bill will be covered. Whether or not you decide to continue with the insurance after the six-week mark is completely up to you. How much is that puppy in the window? There is a price range to expect when purchasing a good, well bred dog. You know the saying “buyer beware.” A well-bred Labrador Retriever, that will make a good family and hunting companion, will cost around $1,000 to $1,500. The life expectancy of a Lab averages about 15 years. Therefore, the price of the dog works out to be roughly $100 per year. At these prices, you will also receive CKC Registration papers. A CKC breeder has a code of ethics to abide by. According to this code, a CKC breeder will not sell unregistered dogs. Unfortunately, there are few gundog trainers left here in B.C. That being said, at about six months of age, you should look into having your pup professionally trained. You will find the end result very rewarding and to be the best money you will have ever spent. The most valuable skill found in a well-disciplined dog is its ability to listen. Happy hunting.